I'm not familiar with these either :o( but I do love getting to know them through you. One day when I'm in Europe and see these I'll have to pick them up. You had me at strawberry. I love the name of this product and it sound so amazing to apply another great introduction. Congrats to Shireen so well deserve. I have never tried anything from the brand but I am definitely going to pick something up:) I love your reviews, and they always make me want to go shopping! I have to say, I was surprised by how much the packaging of these products resembles the packaging for Philosophy products. But then again, I'd much rather pay less for something that works as well as Philosophy, so I'm keeping Beauticology in mind for next time we head over to Europe! These sound delicious! I love strawberry scented body products, but sometimes they don't get the strawberry quite right. So glad this is a good one! omg! Macaron, macaron, macaron... I need this set!!! Yummy yummy! These sound amazing! I know I've said this before but you find the cutest and best beauty products Kim! I love how these are macroon based too!! And congrats to Shireen on wining your Aveeno giveaway! These seem like great products. That body butter seem heavenly. The products sound amazing! I've never used any Beauticology products, but I've heard of this brand. Great review and congrats to Shireen for winning your giveaway! Glad these products smell good! I can't stand it when they smell so artificial! reminds me of philosophy...a great drugstore alternative!! Somehow I feel like better bath products are available in the drugstores in Europe than here in the US. They need to come here. Congratulations to Shireen! The name of the product is so catchy. Thanks for sharing it with us, Kim!! The raspberry cream must smell so good. Hi Kim, these look really nice and remind me of the philosophy line of products. Thanks for the review. Mmmmm...it sounds really good! Congrats to Shireen! Shireen is such a good blogger friend. I'm so happy to met her via you. Thanks Kim! When I spotted this on your Instagram I knew I had to pop over and read the review. Surprisingly, I haven't tried this brand even though there is a Tesco not from from home! 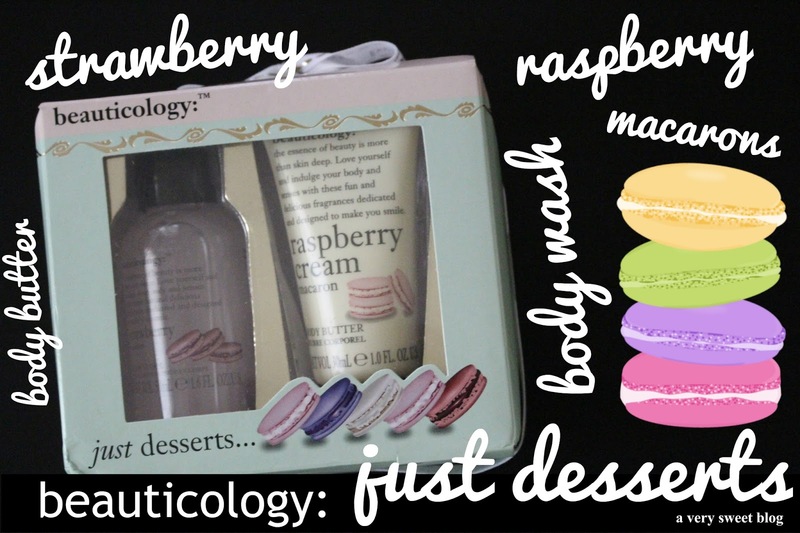 You know my love of macarons, I'm sure I would love this esoecially if the scent, as you say, does not smell artificial. Cute packaging too! Must look out for it! I am surprised you guys don't do collaboration posts! Really lovely to hear when Kizzy sends you things and when you send her things too :) great friendship! Ah, your haul looked pretty good, yeah I would not buy foundation online. And ooo Taco Bell I have not had that in forever! These do not look like something cheap you'd pick up at a pharmacy here…. I love the packaging and the fact that I get to know brands I had not seen or heard of before.